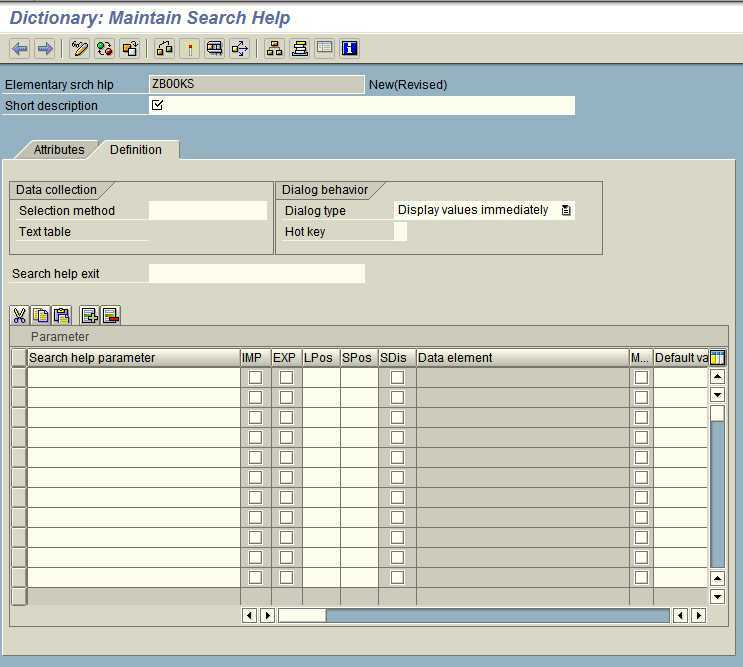 Search Helps are the lists of items such as materials, customers, vendors etc that you see when you press the F4 key or click the button on the right hand side of a field to help you locate a particular material for instance. Search helps come in two guises. Elementary Search helps which allow you to search on one set of criteria only, or as collective search helps which are made up of two or more elementary search helps. Creating An elementary Search Help. Search Helps are created using transaction SE11. Start the transaction and select the 'Search Help' radio button. Enter your search help name starting with 'Z' in the relevant field. Now we need to complete some fields. This field contains a short description of the Search Help. This will appear in the Search Help title bar.